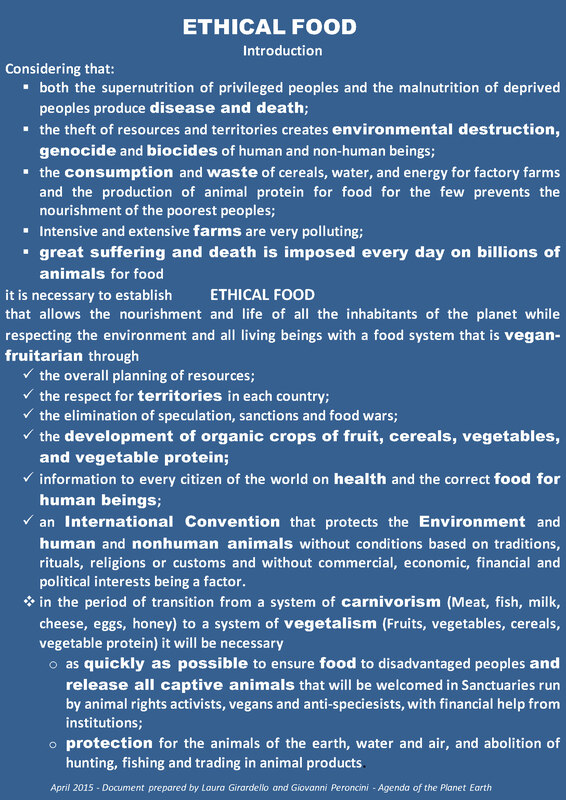 The proposal of "Feeding the planet without killing" is very simple because it interprets the ecological and economic reasons expressed by the UN and at the same time calls for the creation of a true justice system among humans and non-humans. Millions of people who suffer and die due to hunger and diseases while too much of animal protein is killing and deteriorating the health of the industrialised population, the wastage of grain, water, energy used to feed billions of farm animals worldwide annually, the pollution caused by the production cycle in the disturbing hellish scenario of blood and torture involved in intensive livestock farming, to the endless thirst of crowded transportation and the Black Death of the slaughterhouses, demand a change in the culture, economy and habits. This change is strongly felt especially by young people who are mostly vegan and feed on delicious and healthy dishes made from cereals, vegetables, legumes and fruits, as opposed to what "carnivores" who - chewing on corpses - fear that the only alternative is salad. Vegan culture is instead a new cosmic vision of Planet Earth born from empathy for all life forms with the help of new physical and mathematical sciences. Agenda del Pianeta Terra has prepared an on line document (which will be sent to the Secretary General of the United Nations, Ban Ki-moon) that in contrast to the obviousness of the "Carta di Milano", generated by Expo 2015, expresses a precise strategy to make it possible to solve the problem of hunger through non-violence. "ETHICAL FOOD" was called "Carta del Lago Cimino", because unlike the "Carta di Milano", it was born in a place of ancient forests where a small lake survives in a nature reserve of Lazio on the footsteps of the Cimini Hills (in province of Viterbo). enter here to sign the "Carta del Lago Cimino"